Non-Steam versions can be migrated to Steam by contacting 2K Support. SafeDisc DRM[Note 1] or SecuROM DRM disc check (varies by release). Contains all content from Play the World. 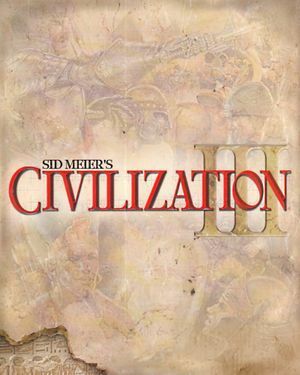 Civilization III Complete is a complete version with both expansion packs. Gold Edition contains Civilization III and Play The World. Play the World adds additional civilizations, game modes, and multiplayer support. 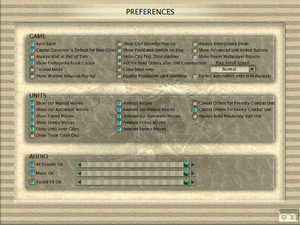 Conquests adds additional civilizations and scenarios to the game, as well as new government types and other features. The Game of the Year Edition contains the original game with a bonus CD containing additional maps and behind-the-scenes videos. Delete or rename CivComplete.bik and intro.bik. Repeat for expansion folders, if applicable. Video file loaded depends on the game version and expansions used. Enabled by default but low-resolution; see Widescreen resolution. Open the configuration file (Civilization3.ini or Conquests\conquests.ini). Save your changes. The game will now run at the desktop resolution as borderless fullscreen. Video Mode is the horizontal window size, with the vertical height calculated based on the 4:3 aspect ratio. The game window will have no border. The game area can't be resized after the game is launched - doing so causes graphic corruption and may crash the game. Online server browser no longer works in non-Steam versions. Steam version has been updated to fix this. Possible option. Used by default. Removed from the Steam version. Issues with the game may be corrected with compatibility settings. For the Steam version go to <path-to-game>\Conquests\ and right click on Civ3Conquests.exe. Select properties and set the compatibility settings. This can cause serious performance issues on windows 10. This is an error caused by a Windows 10 update limiting sound to two channels. Copy the two files, dsound.dll and dsound.ini. GameSpy Removed in Steam update. ↑ 3.0 3.1 File/folder structure within this directory reflects the path(s) listed for Windows and/or Steam game data (use Wine regedit to access Windows registry paths). Games with Steam Cloud support may store data in ~/.steam/steam/userdata/<user-id>/3910/ in addition to or instead of this directory. The app ID (3910) may differ in some cases. Treat backslashes as forward slashes. See the glossary page for details.